Duane Allen Griggs, age 58, of Kokomo, passed away on January 29, 2019. Duane was born on January 16, 1961 to Wiley E. and Juanita C. (Wilson) Griggs. Duane graduated from Taylor High School in 1979. 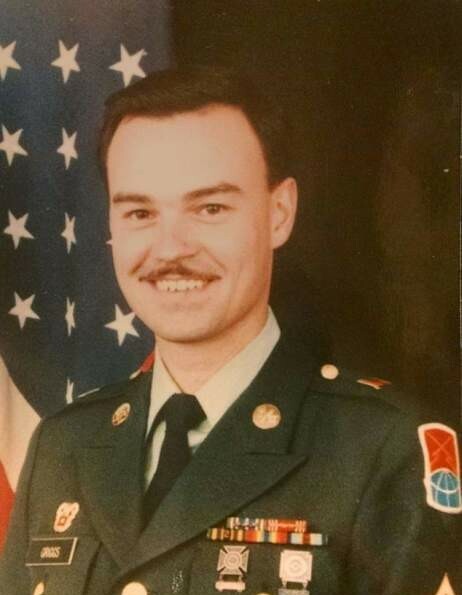 He was a member of the United States Army for 12 years working as a communications specialist. He proudly served beside his brothers and sisters in arms during Desert Storm. Duane was a Sergeant E5 when he departed from the military. When he returned to civilian life, he worked in manufacturing. Duane attended church for many years at Ash Street Wesleyan Church in Tipton and more recently attended Abundant Life Church in Kokomo. Duane had many past-times; he loved to fish, tinker around the house, tackle do it yourself projects, invent all sorts of things, and watch movies. He was a family man; you wouldn’t find him any happier than when he was surround by his family at gatherings. He was extremely generous, and kind hearted, the type of person that would do anything for anyone without a second thought about it. Duane had an infectious laugh, the kind that would make you laugh harder just by hearing his. He cherished the time spent with his wife Debbie Griggs, the love of his life, who precedes him in death. They always enjoyed each other’s company and could often be found at the movies. We know that Debbie was waiting for him at the gates of Heaven with open arms. Those left to carry on Duane’s legacy of love are his father Wiley Griggs; sisters Larky Walker and Cheryl Ogle; brother Darryl Griggs; his children Anthony Griggs, Matthew (Jessi) Griggs, Ryan Montgomery, and Chad (Katy) Montgomery; and his grandchildren Jade Griggs and Kaydee Johnson. Duane was preceded in death by his mother Juanita Griggs; wife Debbie (Stearnes) Griggs; and sister Dixanna Griggs. Funeral services celebrating Duane’s life will be at 2:00pm Sunday, February 10, 2019 at Taylor & Cowan Funeral Home located at 314 N. Main Street, Tipton, Indiana with Pastor Mark Sluka officiating. Burial will follow at Fairview Cemetery in Tipton. Visitation will be on Sunday from 12:00pm to 2:00pm, at Taylor & Cowan Funeral Home. Memorial contributions can be made to the funeral home in honor of Duane. Please feel free to leave an online condolence or share a special memory of Duane with his family on his tribute wall.